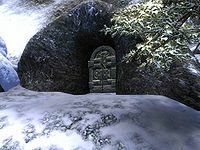 Serpent's Trail is a small cave northeast of Bruma containing monsters and animals (quest-related). It contains only one zone, Serpent's Trail. The Serpent's Trail is a tunnel leading to the legendary hidden base of the Akaviri invasion, Pale Pass. The entrance door to this tunnel will not appear until you have accepted the Lifting the Vale quest. This cave contains 2 Cairn Bolete plants and 23 Wisp Stalk plants. 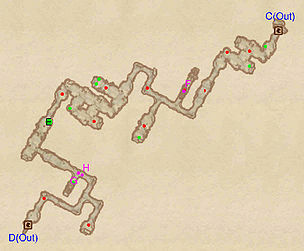 This location's map marker (M on map) is named Serpent's Trail (editor name SerpentsTrailMapMarker). The entrance door is N of the marker, 10 feet away. You enter this cave through door D. Door C at the other end provides access to Pale Pass. For stealthy characters, the narrow corridors make sneaking past enemies very challenging. The numerous twists and turns can make the cave somewhat mazelike, although watching your map helps make it clear that there is only one path through the cave. The one noteworthy item in the cave is the set of Akaviri Orders (E). Although you do not need the orders to complete the quest, having them provides you with an easier option for how to complete the final stage of the quest. Akaviri Orders at location E on map. The orders are lying next to a skeleton, presumably the corpse of the Akaviri messenger. Your journal will update as soon as you approach the area to make sure that you notice the orders. 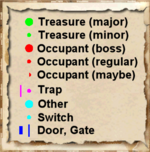 1 Cave In trap at location F on map, triggered as you walk through the adjacent hallway. 1 Swinging Mace trap at G, activated by the adjacent Pressure Plate trigger (H). Door C leads outside to Pale Pass. Door D leads outside to the Tamriel entrance.